Obituary for George Edward Gilmore | Iseneker Funeral Home, Inc. 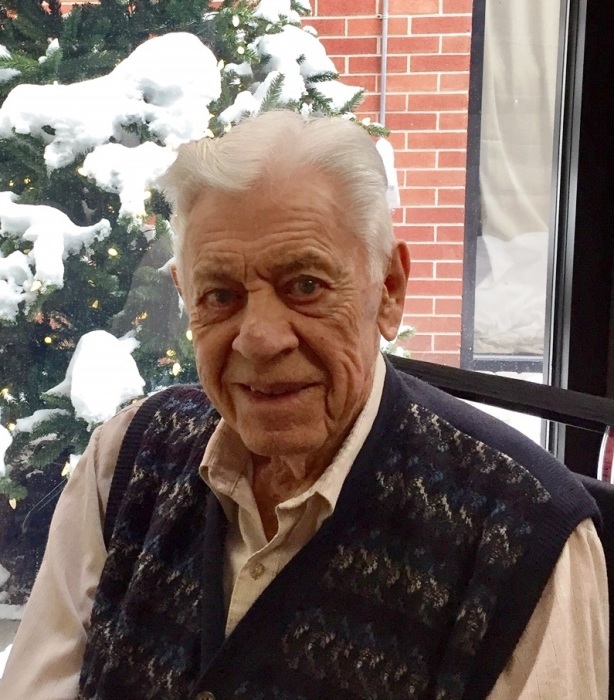 It is with great sadness that we announce the passing of our beloved father and grandfather, George Edward Gilmore on Friday evening, March 29, 2019 at the Lewis County Residential Health Care Facility. George Edward Gilmore was born at Flushing Hospital in New York City on November 6, 1920, a son of the late George F. and Madeline Weinzettle Gilmore. He graduated in 1942 from Pratt Institute with a Bachelor of Electrical Engineering Degree. He enlisted and commissioned as an Ensign in the United States Navy in 1942, where he signed up for submarine service. Operating out of the sub base in New London, Connecticut, he served throughout World War II as the Electronics Officer for the Atlantic Submarine Forces responsible for the installation and training of crews to operate and maintain radar equipment in every submarine built on the East Coast. Having risen to the rank of Lieutenant, following WWII he continued in the Naval Submarine Reserves. His unit was called to active duty from 1950-52 during the Korean War. They were stationed in to Charleston, NC. On March 1, 1952 he was promoted to the rank of Lieutenant Commander, USNR. He resigned his commission in 1958. A devoted husband and loving father, George married his sweetheart Verna C. Dunnett of Sillikers, N.B. Canada on May 15, 1943 at Harvard Chapel in Cambridge, Massachusetts. At the time George was a commissioned officer taking post-graduate classes at M.I.T. in electronics for the development and application of submarine sonar and radar. Verna and George met and fell in love while working at the Pratt Camps on the beautiful Holmes Lake in New Brunswick, Canada. The couple lived most of their married life in Lynbrook, New York where they raised their family. In civilian life George worked as an area sales manager and applications engineer for Westinghouse for about 20 years and then for Consolidated Edison of New York City for another 20 years, retiring in 1985. A member of the Institute of Electrical and Electronics Engineers (IEEE), for many years George was convention treasurer for their annual conventions in New York City. During most of their years in Lynbrook, Verna and George were very active in the Valley Stream Presbyterian Church, where he had served as an Elder and Sunday School Superintendent. George was a current member of the Lowville Baptist Church. In 1990 they moved further out on Long Island to the retirement community of Leisure Glen in Ridge, NY. In the summer of 2003 they moved to their new home next to daughter Carol and son-in-law Everett in the town of Watson in upstate New York. Verna predeceased George in September of 2008 following 65 years of marriage. His son George William predeceased him in July of 2015. George is survived by his daughter Carol Reed who resides with her husband Everett in Anchorage, Alaska, by his daughter-in-law Twila (Silliker) Gilmore of New Brunswick, Canada, and by 4 grandchildren and 13 great grandchildren. Services will be held privately by the family, with internment in the family plot of the St. Stephen’s Presbyterian Cemetery, Boom Road, New Brunswick where his beloved wife and son, and many other relatives were interred. Memorial gifts may be sent to Lowville Baptist Church, PO Box 89, Lowville, NY 13367. Arrangements are through the Iseneker Funeral Home, Inc., Lowville. Condolences may be shared with the family online at www.isenekerfuneralhome.com .